Yesterday I slogged up 3000 vertical feet in 4 miles to get to the top of The Priest from the Tye River. Today I had to go up the other side, to Three Ridges, another 3000 foot climb, but this one was much more rugged (reminiscent of New England in places), and extended to five miles before reaching the summit, with some ups and downs along the way. The weather added a little further difficulty. It was calm and overly warm and humid. Of course I'd rather be sweaty under a bright sun than rain-soaked in the fog, so I'm not complaining. I hiked on beyond Three Ridges summit to Maupin Field Shelter, where I turned around and came back via the white blazes. But it was so tempting to abandon my mission and make the return hike via the Mau-Har trail so that I could experience the many cascades and roaring rapids along Campbell Creek. It's a gnarly trail in places, but worth the effort for a waterfall lover. Unfortunately it has no white blazes, so today I had to settle for my memories of hiking that trail last June. The AT takes a much more circuitous route to get to the same place. It seems to want to take the hiker past every possible viewpoint where a rock juts up or a bedrock slab juts out. Every view is basically in the same direction - south toward The Priest. There are half a dozen of them, at least. For my money, the best of the lot is this one, because I love the site as much as the sight - the open rock slabs are places I love to linger - a rare chance to get out of the Green Tunnel and commune with the sky. Eighteen miles of hiking in 10.5 hours. Even with all the climbing, I wasn't particularly tired at the end of the day. This is a pace I can sustain - indefinitely it seems. 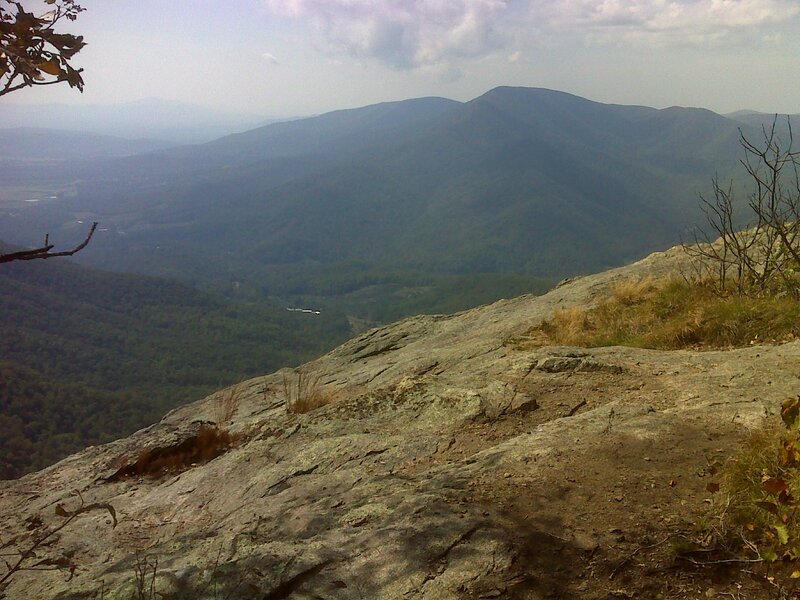 By Sunday I'll be hiking in Shenandoah National Park. The miles seem to be melting away, and the end is coming into sight. Here's the map of today's hike. Note the huge detour the trail takes to get to Three Ridges. The Mau-Har trail cuts off that detour, but it's a pretty strenuous walk either way. The title line provides a link to more photos, viewable as a slide show by default, or you can view each photo individually. Nice Pic, when you go for hiking you feel alive an interaction with nature is important in a year. Everyone must have a hiking tour, hiking in Ireland and rest of Europe is a pleasant experience.